Posted on May 25, 2017 at 12:00 pm. If you’re serious about being a professional actor you presumably have your showreel sorted. But is one enough? Unless you are only applying for lots of very similar parts, your showreel is likely having to cover a lot of ground, showing off wildly different aspects of your acting. Wouldn’t it be more effective to have different showreels tailored to each of the different types of roles you are putting yourself forward for? There are a number of pros and cons with having more than one showreel, making it hard to know whether it’s worth the time and effort. We take a look at the reasons some actors need multiple showreels and the different kinds of showreels you can create. One big mistake people make with their showreels is that they aren’t focused enough. If you want to land a dramatic role and half your showreel is comedy then it’s probably not going to be relevant to any casting directors looking to cast a drama. You are potentially wasting half of the time they are spending reviewing your work and may give the impression that you’re not really that committed to doing drama. This is also true of more subtle distinctions between different kinds of acting. Having a varied showreel can be a positive, in that it shows your range, but it also gives you less space to convince people that you are right for each specific type of role. Having several different reels, each specifically focused on just one area of your acting, can make a much more compelling case for casting you for relevant roles. One concern is that, by showing less of a range you are reducing the chance for secondary casting opportunities. This is when a casting director sees something in your reel that isn’t quite right for the role you are chasing but would be a good fit for another role they are casting. However, since you will usually be sending people links to your showreel online, you can always include a link to the main showreel you want them to see and a secondary link to your others reels demonstrating your range. This means if you do impress them with the first showreel, they can bookmark your other reels to come back to when they are looking at other roles later. This gives you the best of both worlds. Many actors are terrified of being typecast, but in many ways, it can be good for your career. The kind of roles you are likely to be offered will, to a large extent, depend on your look and presence. Knowing your type can save a lot of work and increase your chances of succeeding at auditions because you can focus your efforts on the types of roles you are best suited for and therefore most likely to win. Your showreel can help to define your type, by selecting clips which reflect the kind of roles you are best suited for. If there is more than one niche you fit into, having different showreels that reflect these different types can make it much easier for casting directors to see you in quite different roles. If you have been playing one type for a while and want to branch out, creating a secondary showreel that shows more of your range can help you break out of being typecast. You then still have your primary showreel so you can keep landing those bread and butter, in-type roles that pay the bills. There are as many different kinds of showreels as there are different kinds of actors. The distinctions between drama and comedy are obvious and it can also be an advantage to have separate reels for commercials work versus TV and film projects. It can be easy, however, to slip into thinking you need a separate showreel for absolutely every possibly kind of acting work you might want, but you don’t want to get carried away. For most people, two or three showreels will be enough so that you can convincingly show your ability to fill different kinds of roles. If you start aiming wider than that, chances are you are going to be spreading your efforts too thin and will end up struggling to get cast in anything. 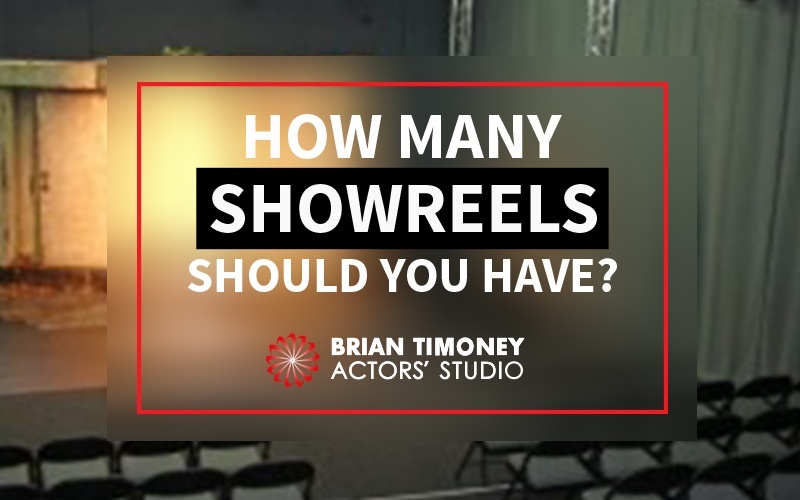 When deciding which types of showreels you want to put together, it all comes down to what kind of roles you want to pursue and what footage you have. One thing to consider is whether it is worth getting a showreel shot from scratch. If you are early on in your acting career or have been typecast for a long time, you may not have too much of a range of different clips to show off. One way to get around this when applying for roles outside of your usual niche is to send your showreel, but add some supporting material specific to the role you are applying for. In most cases, this is likely to be a piece you have filmed especially for this application, which exactly matches your perception of what the role requires. The advantage of this approach is that your showreel will demonstrate your professional credentials and overall acting ability, while the supporting video, even if it’s not a professional clip, should hopefully show that you are a good fit for that specific role. Recently many casting directors have begun asking actors to self-tape audition pieces to streamline the casting process. This means adding in your own custom-shot footage is seen as an increasingly normal thing to do and can be really helpful if you are trying to break out of being typecast but don’t have any strong professional footage to back this up yet. Knowing how many showreels you need is the sort of detail that separates a real professional from a talented amateur. After all, there is a lot more to building an acting career than just knowing how to act. You also have to understand how the industry works and how to successfully navigate your way through it. That’s where we come in. At the Brian Timoney Actors’ Studio we offer industry-leading method acting tuition, but we also teach you the business of acting. This means our students don’t just learn how to act, but also how to take their acting out into the real world to start landing auditions and winning paid roles. After all, you’re not really a professional actor unless you’re getting paid for it and we can show you how to make that happen.